There was an unusual stillness inside Roy Thomson Hall on Jan. 19, when Canadian violinist James Ehnes performed Mozart’s violin concertos Nos. 1, 2 and 3 with a pared down Toronto Symphony Orchestra. The sweet and tender music kicked off TSO’s Mozart@255 Festival with just the right amount of youthfulness from Ehnes, who shares Mozart's birthday of Jan. 27 and who was in total control as soloist and leader. While Mozart composed his first violin concerto in either 1773 or 1775, he most certainly wrote the last four of his five violin concertos between April and December of 1775, when he was 19 years old. “That’s both humbling and disturbing,” Ehnes told the audience. Perhaps due to his regular work in chamber music, Ehnes’ style is relaxed and understated. He has the look and chops of a male diva, but comes across as a down-to-earth virtuoso still imbued with his Brandon, Manitoba roots. Ehnes’ performances here were beautifully nuanced, complete with spirited humour and, throughout, a natural spark. He captured Mozart’s teenage wit and charm with an attractive and refined sound. It was earthy, lively and, most importantly, sensible and perceptive. The depth in the third concerto was especially affecting. Ehnes didn’t really lead the orchestra, beating most of the time with his bow arm when he’s not playing. That being said, the TSO needed very little direction. With the exception of a couple of detectable efforts from the horns early on, the performances were tightly unified and perfectly balanced. The concert overall was like a well-proportioned meal — not too much, not too little. It was just right. http://www.coc.ca/AboutTheCOC/COCInTheNews.aspx?EntryID=11649 The press release can be found on the Scena Newswire at http://newswire.scena.org/2011/01/canadian-opera-company-announces-2011.html In all its promotional material, the COC has opted for the English translation of the original opera titles wherever appropriate. 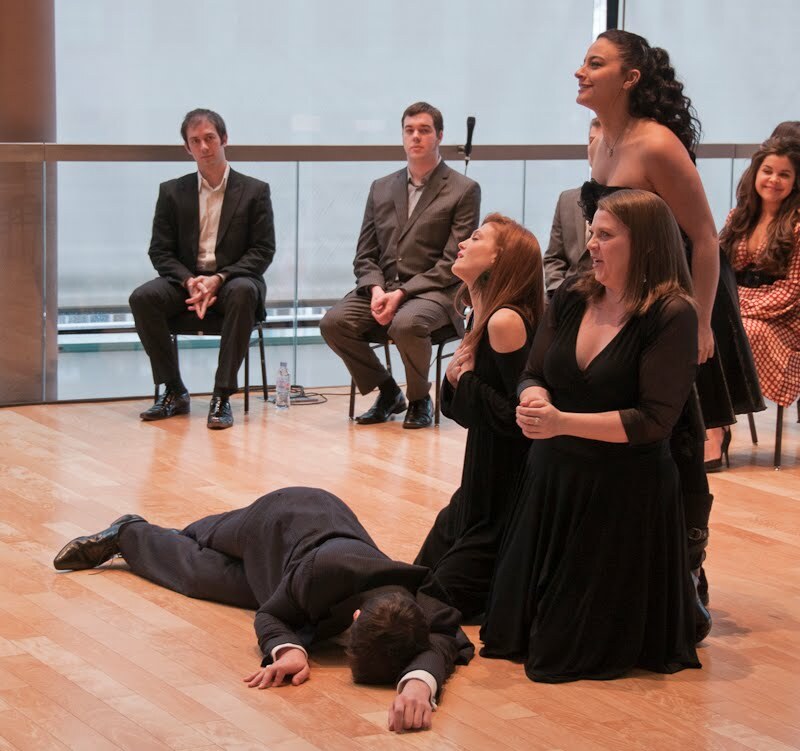 Purists may not be too thrilled by this, but it serves to demystify operas sung in a foreign language and make them more accessible to the general public. Not surprisingly, the 2011-12 season turned out to be a combination of warhorses and the unfamiliar. A total of seven productions, with Gluck's Iphigenie en Tauride opening the fall season starring big-name American mezzo Susan Graham in the title role. Canadian tenor Joseph Kaiser, who has gone on to an international career since his tenure as a member of the Ensemble Studio, returns after many years as Pylades. His buddy, Orestes, is local favourite- frequent guest baritone Russell Braun. Spaniard Pablo Heras-Casado, currently in town rehearsing Nixon in China, conducts. This is paired with Verdi's ever-popular Rigoletto, conducted by COC music director Johannes Debus. American Quinn Kelsey and Lester Lynch shares the role of Rigoletto; and Gilda is shared by Russian soprano Ekaterina Sadovnikova and Canadian rising star Simone Osborne. Dimitri Pittas, who was the student of famed pedagogues Bill and Dixie Neill at McGill, is Duke of Mantua. I heard Pittas several times in Santa Fe, and he has a truly exceptional tenor. He shares the role with Mexican tenor David Lomeli, winner of the Placido Domingo Operalia in 2006. The winter season begins with a revival of the COC production of Tosca, last seen locally in 2008. Soprano Adrianne Pieczonka, who has sung the role previously in San Francisco and Los Angeles, is Tosca. Partnering her will be Carlo Ventre as Cavaradossi, sharing the role with the exciting young Brazilian tenor Thiago Arancam. Those who witness the latter's Operalia success at Quebec City two years ago will look forward to the chance to see him. 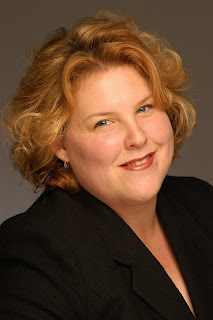 Soprano Julie Makerov, last seen as Senta, returns as the alternate Tosca. Italian conductor Paolo Carignani, a frequent guest at the Met and Frankfurt, makes his COC debut. The other show in the winter season is Kaija Saariaho's Love From Afar, originally titled L'amour de loin. Russell Braun sings Jaufre Rudel, a role created by the great Canadian baritone Gerald Finley. Seen eight years ago at Santa Fe with Finley, Dawn Upshaw and Monica Groop, I found the piece musically strong but the production visually and aesthetically icy. I'm glad we'll be getting the highly regarded ENO and Vlaamse Opera production. Soprano Erin Wall is Clemence and Krisztina Szabo the Pilgrim. The spring season starts with The Tales of Hoffmann. The most significant company debut here will be bass John Relyea as the Three Villains. The son of Canadian bass Gary Relyea, John Relyea is considered a basso cantante of the highest order. The three heroines will be Andriana Chuchman (Olympia), Erin Wall (Antonia), and Keri Alkema (Giulietta). (Who assumes the non-singing role of Stella is anyone's guess) The excellent mezzo Lauren Segal is Nicklausse. Debus conducts his third and final production of the season. Perhaps the most intriguing offering is the double-bill of A Florentine Tragedy by Alexander Zemlinsky and Gianni Schicchi - a most unusual pairing! American bass Alan Held makes a long awaited COC debut as Simone and Schicchi. Sir Andrew Davis conducts, and retired American soprano Catherine Malfitano directs. The season's final production is Handel's Semele, starring Canadian coloratura and former Ensemble Studio member Jane Archibald in the title role. The COC pushes the artistic envelope by engaging Chinese sculptor/performance artist Zhang Huan as director. He will incorporate a strong Chinese element onto Semele - an extremely bold move that has received kudos elsewhere. There you have it - an intriguing and eclectic season to be sure. In a seven-opera season, there will be major omissions. For me, a season without Wagner and Strauss leaves a void, but the opportunity to see A Florentine Tragedy is at least partial compensation. One does get rather tired of warhorses like Rigoletto or Tosca, but with the wonderful Adrianne Pieczonka returning as the Roman diva, I'm not complaining. In any case, we all know it's the warhorses that are paying the bills so we can have more adventurous programming like A Florentine Tragedy and Saariaho's L'amour de loin. These are two of the most important contemporary works - although calling Zemlinsky 'contemporary' is stretching it - but these are acquired tastes. Supporters of 'Made in Canada' creations won't be happy with the lack of Canadian works. For me, my priority would be to stage some of the great pieces in the standard repertoire that have never been done in Canada - Tannhauser, Parsifal and Die Frau ohne Schatten come readily to mind...and maybe followed by Schreker's Die Gezeichneten, or Henze's Boulevard Solitude. Hey, I can dream, can't I? 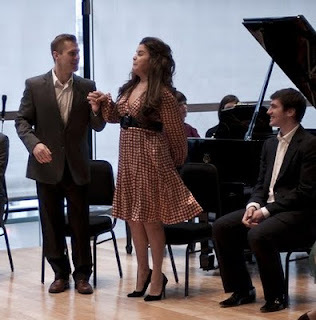 Left: Adrian Kramer (Papageno) and Simone Osborne (Pamina) with Christopher Enns (Tamino) looking on. Top Photo: Ambur Braid as Queen of the Night, Neil Craighead (Speaker) seated. It's often said that Mozart is balm for the singing voice, and in particular young voices. So it's logical for the COC to choose The Magic Flute from among the 7-opera 2010-11 season to showcase its Ensemble Studio artists. Yesterday we got a chance to hear what these young singers can do. All of them will appear in the specially-priced Ensemble show on Feb. 17, and most will sing supporting roles in the other mainstage performances. So this noon hour concert was a sort of 'dry run' for them. It's amazing how much music can be squeezed into a single hour - in fact, 11 pieces were dispatched in just 45 minutes! A couple more arias could have been included, such as Pamina's "Ach, ich fuhl's" or Queen of the Night's dynamite "Der Holle Rache." While all ten singers, all at the beginning of promising careers, bring to the stage their unique brand of artistic gifts, what they do have in common are fresh, attractive voices, solid training, and most importantly an unswerving focus, commitment and dedication so necessary to succeed in this difficult profession. In this one hour, I heard a great deal of beautiful singing and vivid acting. This preview really makes me look forward to the Feb. 17 Ensemble show. Among the many highlights was the opening scene, "Zu Hilfe! Zu Hilfe!" where Tamino swoons after being pursued by a serpent. The Three Ladies fight among themselves over the handsome prince. I loved the highly detailed staging by Diana Paulus, funny but not over-the-top. Montalbetti, Giunta and Chaieb were an impressive trio of Ladies, and they really got into the good-natured fun of this scene. Christopher Enns has a bright, ringing tenor of good volume and fine quality. I last heard him in a Heliconian Hall concert over a year ago, and he showed a great deal of promise then. Since tenors don't grow on trees, I predict Enns will have a fine future if he continues to develop, learns to pace himself and not push his voice. I also liked Adrian Kramer's "Der Vogelfanger bin ich ja" - he is perfectly cast as Papageno, singing with a beautifully modulated, compact-sized voice and acting up a storm, the only thing missing was his pipe! For a principal role as short as the Queen of the Night - under ten minutes of singing depending on the tempo - it almost always gets a disproportionate amount of applause. This afternoon was no exception - coloratura soprano Ambur Braid wowed the audience with her vocal pyrotechnics, displaying a big, perfectly placed high F in "O zittre nicht, mein lieber Sohn." The fast rising soprano Simone Osborne was a warm and endearing Pamina in her charming duet with Papageno; and Jacqueline Woodley a delightful Papagena in that short duet with Papageno. The audience gave the artists a rousing ovation at the end. Over more years than I care to mention, I've seen dozens of performances of The Magic Flute. I dare say it's never lost its magic with me. It's great to be once again under its spell.